Residents encouraged to be vigilant about monitoring river conditions – Welcome to Wyandotte Daily! The Corps of Engineers today urged people to continue being vigilant about monitoring river conditions. Local officials said on Wednesday that they did not expect flooding on the Missouri River to affect any residences in Wyandotte County. The river levels and expected crests of the river at different places changes every day with the changing flow of water in the river. Today’s breach of a levee across the river from Atchison, Kansas, is expected to have an effect on the river levels downstream in the Kansas City area. 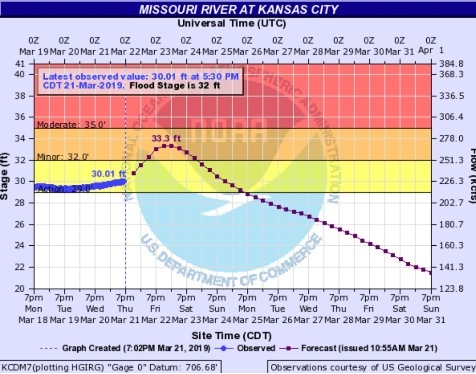 The Missouri River at Atchison, Kansas, is now in major flood stage and is projected to rise to a record level of 31.8 feet on Friday, according to Corps of Engineers officials. 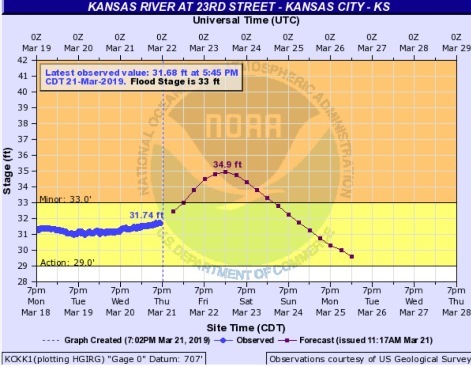 The Missouri River in the Wyandotte County area currently is forecast to crest on Friday night in Kansas City, Kansas, according to this afternoon’s updated hydrology charts. 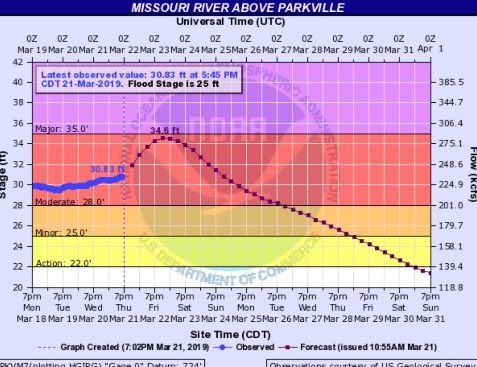 The Missouri River above Parkville, Missouri, a gauge on I-435 over the Missouri River that also includes Wyandotte County, is now projected to crest at 34.6 feet, just below major flood stage, on Friday night, according to hydrology charts. The Wolcott levees in western Kansas City, Kansas, will be overtopped at 32 feet and 32.5 feet, according to hydrology charts. The current level on Thursday afternoon is 30.83 feet, and there were no signs of flooding visible from the road Thursday afternoon at Lakeside Speedway on Wolcott Drive, next to the Missouri River. There was, however, some water in fields down the street on Wolcott Drive. This location is west of I-435. At the Missouri River at Kansas City (not far from the Kaw Point and James Street areas), and the Kansas River at 23rd Street (Kansas Avenue near the state line), both affecting the east edge of Kansas City, Kansas, the rivers are projected to go into minor flood stage and will crest either Friday or Saturday. The rivers in this location are not projected to affect any homes. Rain that is forecast this weekend is not projected to have an effect on flooding in Kansas City, according to officials. Corps of Engineers officials reported today there were 43 confirmed breaches or overtoppings of levees in Nebraska and Iowa in the Omaha district. Another total nine were in Kansas or Missouri in the Kansas City district. Today was the first time a federal levee in the KC district was overtopped since the 1993 flood, officials stated. That levee was in Doniphan County, Kansas, near the St. Joseph area. The other seven levees that overtopped or were breached were nonfederal levees, officials said. While they don’t expect to see a lot of levee damage, it is a possibility, officials said, and they encouraged people to monitor the conditions in their area. Additional levees could overtop today, officials said. The Corps of Engineers is providing mobile teams to assist levee districts and local authorities that request help through the local emergency managers. The corps has more than 3.6 million sandbags on hand. Water releases from the Gavins Point dam in South Dakota were reduced from 28,000 cubic feet per second to 24,000 cubic feet per second on Wednesday. They were scheduled to be reduced to 20,000 cfs by this morning, but because inflows from the Niobrara River continued to match releases, the releases were kept at 24,000, according to Corps officials. The Corps is monitoring runoff throughout the Missouri River basin, officials said. David Mehlhaff, a spokesman for the Board of Public Utilities, said Thursday morning that the BPU is monitoring the Missouri River levels very, very closely at its plants. 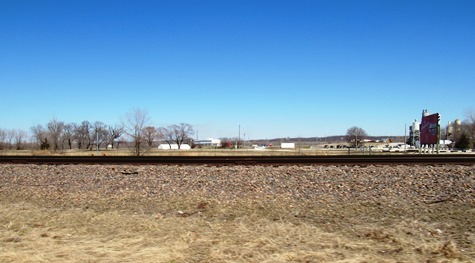 The BPU Nearman Creek plant is near North 55th and the Missouri River in Kansas City, Kansas. The BPU Quindaro plant, also on the Missouri River, was shut down earlier this year. Residents also may call 511 on their telephones to find out about road closures, and 211 to find out about essential community services. Road conditions are available online at www.kandrive.org/kandrive. Wyandotte County residents may call 311 to find out about local government programs and services. There were no signs of flooding on Thursday afternoon at Lakeside Speedway, as seen from Wolcott Drive. The location is west of I-435 in Kansas City, Kansas.